Samsung Galaxy phones have always accounted for a significant share of the smart phone market. Its latest releases of Samsung Galaxy Note 9 is attracting a huge amount of users. As a new generation of Android King, Samsung Galaxy Note 9 is impeccable in terms of design, quality, and performance. However, it faces the same data loss issues as other Android phones. So, how to recover deleted data from Samsung Galaxy phone has become one of the most concerned topics. Is It Possible to Recover Deleted Files from Samsung? Accidental Deletion: We all make mistakes, none of us is perfect. Factory Reset: It will erase all data from your device. System Upgrade: If something goes wrong or you do this improperly, data loss may occur. Viruses & Malware: It can steal personal information and delete swaths of data. Lost/Theft: If your phone is lost or theft, you will having nothing at all. Phone Broken: You can’t access data from the broken, cracked, or water spilled phone. Rooting: Normally, it does not erase anything but if the rooting method does not apply properly, your phone can get crashed or damaged. It can be seen that there are many reasons can result in data loss. Either way, it will bring huge losses to users, which is quite frustrating. Fortunately, technology makes everything is possible! When you deleted files on your Samsung Galaxy Note 9/S9/S8, the OS only removed the pointers to the files and marks the memory space containing the files as blank and available for use. In other words, files are no longer present, but not erased. That’s why you find data “lost”. Actually, the deleted files are still on the memory until new files overwrite them. With the help of a professional Samsung data recovery tool, it is entirely possible to recover deleted files from Samsung. Gihosoft Free Android Data Recovery is a powerful Samsung data recovery app. 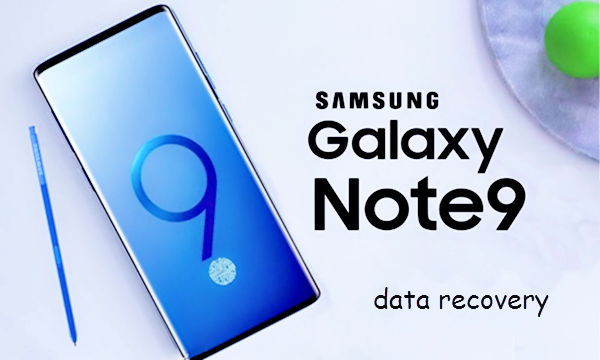 With it, users can recover deleted or lost contacts, call logs, messages, photos, videos, audios, WhatsApp and Viber chat history, etc., from Samsung Galaxy Note 9, Samsung Galaxy S9/S9+, Samsung Galaxy S8/S8+ as well as other Android phones quickly. What’s more, this Samsung data recovery tool is highly reliable and extremely easy to use. You can view the step-by-step guide below to learn how to use this program to recover deleted data from your Samsung Galaxy phone. 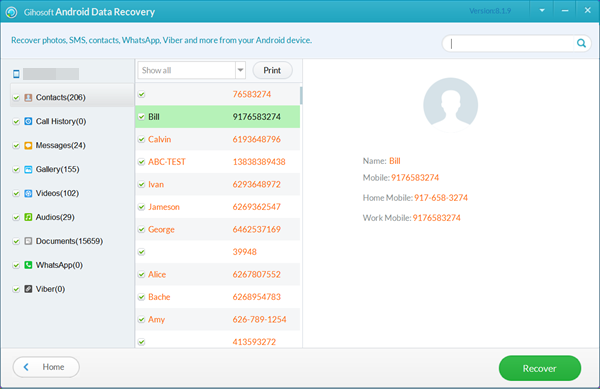 Download and install this free Android data recovery recovery on your PC/Mac. Launch it, then select file types from the main interface and tap “Next”. Enable USB debugging on your phone first and connect it to the computer via a USB cable. Tap “OK” or “Allow” to authorize the connection on your phone screen when prompts. Once connected, click “Start” to scan the lost files from Samsung Galaxy phone. After the scanning process is over, you can preview all recoverable files that you’ve deleted. Check out any data you want, tap “Recover” to restore deleted data from Samsung. Why Choose Gihosoft Android Data Recovery Software? With advanced algorithm and superb scanning technology, this free Android recovery software can scan maximum lost data on your Samsung and recover them perfectly at minimum damage. Fully compatible with Windows and Mac platforms. Thus, when you download this software, you are no need to worry about compatibility issues. Works perfectly with numerous types of Android devices, such as Samsung, Huawei, LG, HTC, Motorola, Google Pixel, OnePlus, Sony, Lenovo, ZTE and so on. Recover files from Samsung lost due to mistake deletion, formatting, factory reset, rooting, OS update, system crash, virus attack, etc. Safe and reliable. Only read the deleted or lost data from your Samsung Galaxy and won’t perform unauthorized behaviors such as modification, deletion etc. User-friendly. You can preview deleted files before recovery and save the data you want only to readable format like HTML for easy viewing or printing. It’s free to try. You can try the free trial version before purchase, and even after your purchase, we offer a 30-day money back guarantee. It’s best to stop using your Samsung phone after data loss. Any operations like message sending and receiving, photo shooting, video recording etc. may overwrite the lost data and make these files corrupted and irretrievable. To let the Samsung data recovery software identify your Galaxy phone, you have to turn on USB debugging before connecting it to computer. The method varies on Galaxy phones that running different Android OS version. Backing up your Samsung Galaxy phone regularly is absolutely a great way to protect your important data from unexpected loss. You can use Gihosoft Phone Transfer to transfer contacts, SMS, call logs, calendar, photos, videos, music from Samsung Galaxy S9/S8/S7/S6 to the computer for backup.